Khashoggi was an advocate for reform in his country, but he neither saw himself as a dissident nor believed in bringing radical change to a nation that has operated for the past eight decades as an absolute monarchy. He relished his newfound freedoms in the United States and the attention his writing got from a Western audience, but he often resisted appeals from associates to be more forceful in his criticism of the kingdom. He was by many accounts depressed by the separation from his country and the strain that his departure and work placed on his family. I wonder if this is the first the Saudis have heard of this? There was no immediate comment from the Saudi government, which in October delivered $100m to the US, two months after pledging the sum to help stabilise parts of Syria and just as the international outcry over the disappearance of Saudi journalist Jamal Khashoggi and Riyadh’s shifting narratives about his fate grew. Al Jazeera’s Rob Reynolds, reporting from Washington, said the initial reaction to Trump’s announcement was “one of bafflement” as no other US officials had commented on his statement which also came on a day that the president was not scheduled to have a telephonic conversation with the Saudi leadership. “It came out of nowhere and there are more questions than answers, including how much money is he talking about. We know that the Saudis in October delivered $100m intended for Syria reconstruction but the president’s tweet seemed to imply that there was more money that is going to be forthcoming,” said Reynolds. More trying to talk up a revolution/rebellion. Utlima Thule has a circular (not elliptical) orbit & appears to have avoided any major collisions in the 4.6 billion years since the solar system formed. Three-and-a-half years after giving humanity its first close-up view of Pluto, and almost 13 years after launching from Earth, the New Horizons spacecraft will explore another new frontier: a reddish hunk of rock and ice known as Ultima Thule. Ultima Thule is 6 billion kilometres from Earth. 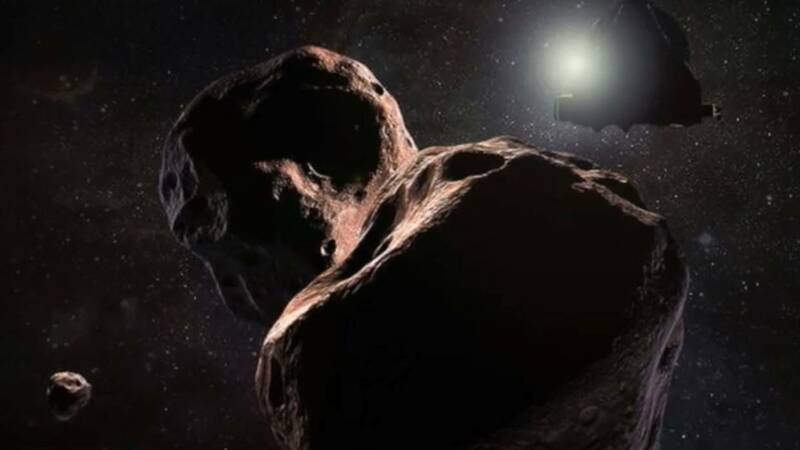 New Horizons will reach it as the new year arrives on January 1, with a mission to collect as many images and as much data as possible while speeding past at 51,000 kilometres per hour. The Ultima Thule fly-by is an encore for the New Horizons mission, led by the Johns Hopkins Applied Physics Laboratory. The baby grand piano-sized spacecraft designed and managed for NASA on the lab’s Laurel, Maryland, campus zipped past Pluto – its primary mission – in July 2015, revealing craggy, icy surfaces and a wisp of an atmosphere around the dwarf planet. It will capture similar images and data as it passes even closer to Ultima Thule, itself about 32km across. Based around an obviously edited clip with remarks taken out of full context. Seems likely to be fake news Al. See if you can find the full interview and post it. And that’s all he did. On the other hand, Trump as you know is personally responsible for everything that happens everywhere. Unless it’s bad stuff. And then he says he isn’t. But if its good stuff then he is. Or something. Give it up Al, Obama’s a has been. Let’s focus on the current loser in the White House. The Big Spoilt Rich Kid who throws endless tantrums. Let’s just keep an eye on his Twitter feed and watch what happens. Poor old Barak is gone so there’s no point trying to make him look bad. It doesn’t make Trump look any better. Europe’s far-right community is boycotting Toblerone chocolate after learning that the sweet is now halal. The certification that enables practicing Muslims to eat the well-known triangular chocolate actually came in April, but a social media post by a spokesman for the far-right Alternative for Germany party, known as AfD, brought it to the forefront last week. Then came the hashtag #BoycottToblerone, which has since spread to other countries, including England, France and the Netherlands. Extremists are pointing to the chocolate as an example of how Islam has seeped its way into Europe. “Islamisation does not take place – neither in Germany nor in Europe,” AfD spokesman Jorg Meuthen posted on Facebook. “It is therefore certainly pure coincidence that the depicted, known chocolate variety is now certified as ‘HALAL’.” Halal means a food has been prepared according to Muslim law. Among the rules are bans on pork products and alcohol. Food that is not halal is called haram. Mondelez International, which owns Toblerone, told CNN that the production process for the chocolate made in a factory in Bern, Switzerland, didn’t need to be adjusted to earn the halal certification. Hope nobody sent any to Corks for Chrissy.